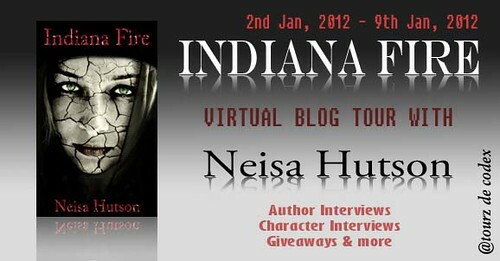 Author Neisa Hutson is touring for her book INDIANA FIRE with Tourz de Codex and we are proud to present ourselves as the first tour stop. Neisa Hutson currently lives in Farmington, West Virginia. When she’s not reading, she is writing. When she isnot writing, she is spending time with her fiancé, her family, and of course her dog Tia. In the past she has worked with the local newspaper, but is undecided on which direction to take with her writing career. 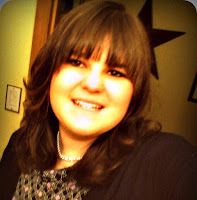 She graduated from North Marion High, and even though she is not in college, she is enjoying her time working,reading, and growing as a writer. For the time being she spends her time writing stories, working on her other love, painting and sketching, and blogging about her favorite books. Her first novel, Indiana Fire, was written for friends, writers, and fans of zombies alike. Her love of Dystopia led her to writing her own novel in hopes of making it unique and original. I currently live in Farmington, West Virginia. I am twenty years young, and I libe with my parents and only sibling. My first love is sletching and art in general. Unlike writing, I've done it ever since I can remember. I love dogs and horses. I'm a big animal lover, and I love to write a book with the dogs as the main focus. I went to North Marion High School, and I was in the FFA. I know very country, but I was also in the Beverly Hillbillies. I played Ms. Hathaway. Q: It is often said that if you can write a short story you can write anything. How true do you think this is, and what have you written that either proves or disproves this POV? I write a lot of fantasy, therefore, I don't do as much research. It all depends on whether or not I write it into our world or if I create another. Most of my fantasy books take place in other worlds simply because I have freedom there to make the world how I like. When writing about my own world, I usually keep it close in places that I have visited at least once. If the character goes through a state, I research that state and try to talk to people from that state. I usually in general speaking try to keep my books in my state or somewhere close that I know a lot about. I want to keep things as realistic as possible. It is the freedom of my career that no other career has. I can write in my own time for now, and I have the freedom of subject. Even more than that, it's being able to pull yourself away into a world that you've created. The best part is seeing or hearing of someone who read your book and liked the novel. For me it is the hope that someone will read my book and be inspired to be a writer. Q: Did you always have in mind to be a writer, or did it just happen? It sort of just happened. When I was younger, we didn't have a computer. It wasn't until my eigth grade that we got one. I really did not even search about it after that. I was 'naive' so to speak. I did not know about agents, publishers, editors. All I knew was that I too wanted to create my own world. I did it not for the career itself, but for my new found love of writing. Its about a girl named Christine who lives in a dying America. The people have been broken apart, and are fighting for survival. I wanted something personal and something that readers can relate to in an unrealistic world. Q: How would you describe INDIANA FIRE in a sentence? What will you do, when the people are gone and the Blayz walk the streets? Q: How did the idea of writing INDIANA FIRE spring up in your mind? I had bewn recently influenced by writers like Carrie Ryan, and I had seen movies like Zombieland. I wanted a story though of my own and an original tale. My fiancée is also a writer on the side. I wanted a story that he could get into. I wanted something that young girls and guys could read. When I sat down to write, my first thoughts of were him and the action and pain I wanted the readers to experience. Last but not least let's not forget my passion for the undead. Q: When you sit down and write do you know how the story will end or do you just let the pen take you? I.E., do you develop character profiles and outlines for your novels before writing them or do you let your ideas develop as you write? I usually end up as surprised as the readers. I hate outlines, and I think that it is more fun without them. One of the most fun parts of writing is the surprise that comes from the ideas that appear as you write along. When creating characters though I like to outline them before writing. I think it is fun to sit, name a person, and have control over their emotions and who they are. It also helps put a clearer picture of them in my head. The best would have to be the knowing that in your career you have endless opportunities. You can create a story about anything you want. And personally, I think that it is relaxing. Its knowing that you can inspire someone to become a writer and go after your once dream. Tye bad aspects would be the agents and the publishers. It's knowing that you might not have a steady pay. The getting over the rejections that's the hardest. I am I'm in some physical features and some mental. We both look the same and we both love a man whose been through a lot. -Your favourite books and author? Its hard to choose just one. I love many different genre. Anythng 80:s I love! You can't go wrong with Take On Me or Don't Believing. My favorite artists would have to be Taylor Swift, Shiny Toy Guns, Switchfoot, and Bruno Mars. -Favourite place in the world? Warhorse and I loved it! -The last book you read? I hate to admit it but yes. -If you weren’t a writer, what you would be? probably be an art teacher or something in the arts department. -And last one....print or ebooks? Print! I want a library in my home with the ladder to reach them. Q: The covers of both books are really awesome. Did you have any input in the process? Yes, I had all say in what it looked like. Rejection as a human is hard to stomach whether it be about writing or your friends at school. You have to learn to accept yourself first and learn to love yourself. As a writer you must learn that every book has that special someone, that special agent or reader. You just have to find them. It is a career that for the most part you do alone. I am the type of person who normally stays to myself which makes my job all the more fitting. I just think that you need to stay confident. Everyone has to start out somewhere. Everyday you look over your shoulder. Every night you lock the door and lay the gun next to your head. Every touch, every breath, and every scar could mean death. Every day you live in the fear of the Blayz...This is my world as I hide inside the walls, but even here the disease rages on killing us off one by one. The world outside seems so cruel now compared to the one I live in, but good things don't last forever. I hide in fear of the disease, the Black Fire. The burning causes your mind to go insane, then your skin turns black as ashes decaying by the second, and third you turn into a Flaym hoping wishing that someone would kill you, end the pain. I am locked away from this world, until I met the green skinned boy who promised safety within 'Alamo', a place deep within the West Virginia hills. Traveling is dangerous, and the state is far, my chances of making it there are little to none. I can only hope that I will find my place across the ocean. If only I could escape this world where the skin crawls, humans are scarce, and the Blayz fill the streets. A flash of movement and a screaming end to the Blayz that line the Florida shores. My days of killing are over as the government releases me from my duties. Along with my friend Broc, I travel North to a place once known as New York. I go there not only to flee from the disease, but I go there in hopes of finding my lost love. After years of pain, watching my own brother kill his daughter, and leaving my fiancée behind, I am ready to return to the sane. But even there within the walls there is not much comfort. A dead lover and no home. I find comfort in knowing a young man who loved a young girl, who had been long gone from the city. We find peace in an island off the east coast, and it is there that I learn that the Blayz aren't the only things we need to fear. Together we travel to a place called the Alamo. A deadly journey begins to a place known as Indiana where the disease began. This is a place where mutants roam and disease spreads consuming everything dead or alive in it's path. Every touch, every breath, every scar can kill. A dystopian raging with a deadly disease. This is a dying world. The world outside is cruel now compared to the one they live in, but good things don't last forever. They hide in fear of the disease, the Black Fire. The burning causes your mind to go insane, then your skin turns black as ashes decaying by the second, and third you turn into a Flaym hoping wishing that someone would kill you, end the pain. A job well done by the author for you definitely can't leave the book for even a second. Now its giveaway time and i'm pleased to inform you all that the author is giving away 2 ebooks of INDIANA FIRE....yes there will be two winners. But there is something else when the tour finishes on the 9th Jan, all the winners from all the tour stops will get dibs to win a cool key chain locket (sorry forgot to mention this bookmarks as well). So enter and maybe you just might be the lucky winner.